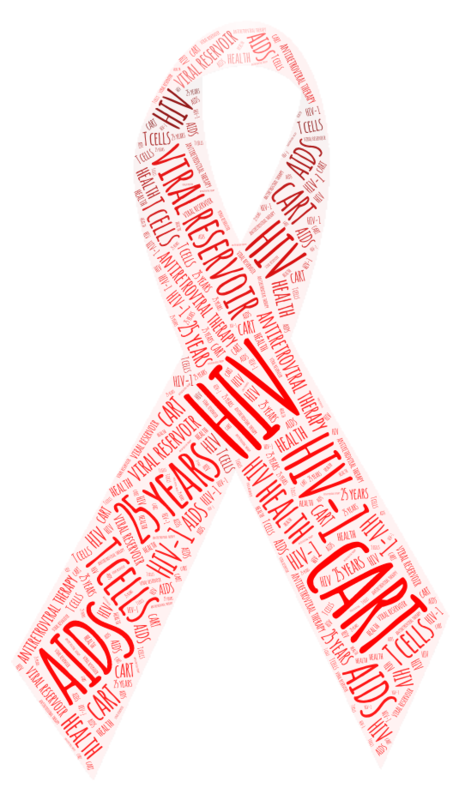 During the past 25 years, the development of antiretroviral agents and the advancement of combined antiretroviral therapy (cART) brought a drastic change in the health of people living with HIV. The extent of this improvement is such that in developed countries, HIV infection is currently managed like any other chronic disease that requires daily medication to keep a person in good health. However, cART alone cannot cure HIV, even if it partially or completely suppresses viral replication. Chronic inflammation and bacterial translocation are still observed in the gastrointestinal tract, and reconstitution of specific sub-populations of T cells and other lymphoid compartments remain incomplete. Moreover, HIV-1 can remain latent for decades in memory T cells, remaining untouched by cART and hidden from the immune system of its host. The virus hidden in cells, called a viral reservoir, is responsible for the viral load rebound observed following treatment interruption and is the main cause HIV cure has not been reached yet. Recent efforts towards HIV cure included reservoir purge, where a drug is used to activate HIV lying dormant in cells, and genetic therapy, where cells from patients were modified to mimic the natural resistance to HIV and prevent its entry into cells. These approaches have not been highly successful until now. Hematopoetic stem cell transplant from a compatible donor not expressing CCR5 yielded viral remission for one patient (the Berlin patient), however this approach would not be feasible on a large scale. In 2013, a report had suggested that a child infected with HIV at the time of birth and treated at 30 hours of life with cART was able to control the virus without medication once the treatment was accidentally stopped. A subsequent report indicated the virus had been detected once more in the blood of the child, and that the child had been able to control the virus without medication for a total of 27 months. This case, named the “Mississippi baby”, was highly publicised and suggests that an early cART initiation might be the key to minimize the creation of an HIV reservoir. In parallel, another study presented by our team at the 2013 Canadian Conference on HIV/AIDS Research measured the quantity of proviral RNA of HIV-1 in peripheral blood and the HIV-specific immune responses of 9 Canadian children infected with HIV following vertical transmission and started on cART early (about 2 months of age) or later in infancy. Replication competent virus was isolated from 4 children who were treated later in life, but no virus could be detected in the blood of children who had started treatment early. In addition, no HIV-specific immune response could be detected in children who had started treatment early. Four Canadian children who were infected with HIV following vertical transmission and who initiated cART within 72 hours of birth presented sustained viral suppression and were followed up and evaluated by our team members. Our results matched those found in other sparse reports. Is HIV viral remission possible following the early initiation of cART in children perinatally infected with HIV at the time of birth?